Now do you think Jack the Ripper is either a deranged medical man, a homosexual serial-killer, or an American con-artist? Huh? What's that? You think that he's all three of these definitions rolled up onto one? Yes. That's correct. Your prize is to now watch this great 45 minute documentary made in 1985 for some of the reasons why. In this timely 'Jack the Ripper' documentary, it's host, David Jessel, chronicles the Whitechapel murders of 1888, as well as one of its most prominent suspects, Francis Tumblety. As expected, David's oration is complemented by stock-photography, re-enactments, plus one on one interviews with numerous specialists in this field. This includes Two Historians: Professor Bill Fishman and Sir Christopher Frayling. Two Forensic Pathologists: Doctor Iain West and Professor Jeremy Coto. Two Authors: Stewart Evans and Paul Gainry. With the Bookseller: Eric Barton. What now follows is a basic overly of how this program plays out. What was Whitechapel like in 1888? It was an area of London for the unemployed, the feckless, the transient, and was labelled 'The City of Dreadful Night'. Why did so many newspapers cover the 'Jack the Ripper' story at the time? When the newspaper tax was abolished a few years earlier, the media industry singled out this crime, and decided to cash in on it's notoriety by making a name for themselves. How come 'the Ripper' was bestowed with the forename 'Jack'? As denoted by the numerous penny-dreadfuls published during this era, it was fairly common knowledge that 'Jack' was the name of the 'common man'. 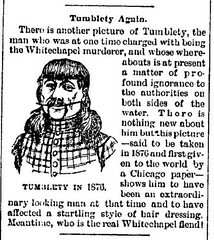 How did Francis Tumblety become associated with the Whitechapel murderer within recent history? When his name was discovered in an old letter written by the first commander of the London Metropolitan Police Special Irish Branch -- Detective John Littlechild -- who sent it to the journalist, George Sims, explaining how this IRA sympathiser come quack doctor was the killer in question. Did the police ever question Francis about this? Quite possibly. Because he was caught for gross misconduct prior to the last murder, yet was still able to skip bail because the authorities couldn't hold him for this type of misdemeanour. Where did he go? Back home. To America. Disappearing from his usual haunts before Detective Walter Andrews could question him about this matter. What did Francis do prior to going to England? During his youth, this Irish-American was a hospital janitor in his hometown of Rochester, New York. However, after disappearing for ten whole years, upon his return, he re-established himself as being a doctor of sorts, selling herbal remedies to the masses. What was Francis possible motive for killing women? By discovering that his wife was a prostitute, and in disgust, turning his back on all woman-kind, looking upon them as 'distasteful cattle'. What's the present day theory about Francis being Jack? (1) He was in Whitechapel at the time of the murders. (2) Francis had a collection of uteruses in his possession, and it had been duly noted that there was an American quack doctor who attempted to buy uteruses over this period. (3) An American gentleman left a black leather bag in the Charing Cross hotel with pornographic literature in it. And Francis himself peddled this type of material when he was a just lad. (4) The landlady of a boarding house in Batty Street said that one of her lodgers -- an American gentleman -- came home in the early hours of the morning with blood on his clothes. Now this is significant for two reasons. Firstly, this house was only one street away from where Elizabeth Stride was murdered. And secondly, the police kept an eye on this establishment because they knew that an American Doctor went slumming in the East End. (5) It was known that Francis accidentally killed a man by giving him one of his herbal remedies. (6) When he died, Francis had in his possessions two cheap imitation Gold rings, and these items were similar to the ones that went missing from one of Jack the Ripper's victims, Anne Chapman. Now I know that this might sound like a bold statement to make, but in my eyes, Francis Tumblety is none other than 'Jack the Ripper' himself. OK, I admit, like many of the other suspects on the list, there isn't any definite solution that screams out 'He's the one'. Still, for the life of me, there is something deep inside, gnawing away, which just says this is so. 'But why?' you may ask. Well, to be honest with you, crime fans, it's more of an instinct I have rather than a logical deduction. 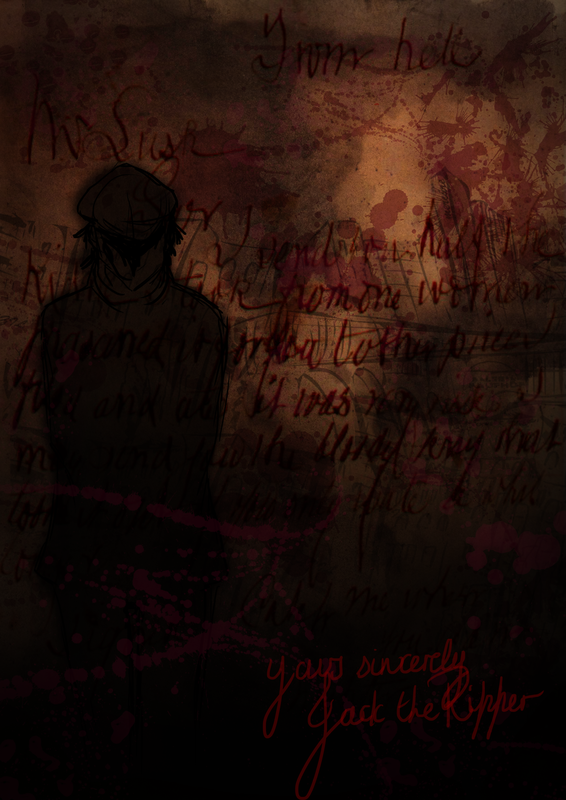 Part of me knows that there is no way of knowing that both Francis and Jack are one and the same person. Whereas another part of me feels that there are too many coincidences and truisms to really think otherwise. Come on. Let's fact it. From a cursory standpoint, we know that Jack hated women, was living in Whitechapel at the time, must have had some sort of rudimentary medical knowledge, and was most probably a-sexual by nature. Moreover, there's the visual aspect to also consider. General consensus says that he was a man of nondescript appearance, and had a way of blending and mingling in with common folk no matter their grace or heed. Granted, to contradict this standpoint slightly, I know that Frances was about 20 years older than Jack's supposed age-range, and was from American decent too. Nonetheless, is age and nationality enough to dismiss him completely? No. I don't think so either. Anyway, before I get too carried away with myself, here, check out these Frances facts for more about the man in question. 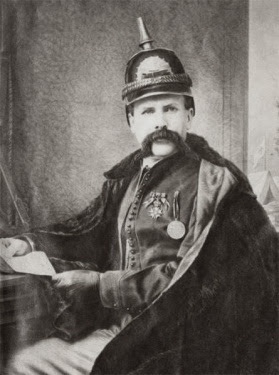 (1) Depending on what you've read, Francis Tumblety was either born in Canada or Ireland sometime in 1833, and died in Rochester, New York, on the 28th of May, 1903. (2) Francis came from a very large family, and was the youngest of eleven children. His siblings were called: Patrick, Lawrence, Jane, Bridget, Alice, Margaret, Ann, Julia, Elizabeth, and Mary. Also, his surname varied in spelling too. Ranging from 'Tumblety', 'Tumuelty', 'Tumility', or 'Twomblety'. (3) Although is it generally recognised that Francis was a quack Doctor, when he set-up shop in Detroit during the 1850's, one of his most flourishing herbal medicines was the patented 'Dr. Morse's Indian Root Pills'. According to Francis, this 'concoction' would cleanse all of the impurities in your blood, thus reduce any infections or diseases. (4) Tumblety was detained for twenty-five days by the police from the 5th of May, 1865, because of his association with David Herold, who was involved with John Wilkes Booth's assassination of Abraham Lincoln. (5) As implied by this documentary, it is believed that Tumblety had a long distance love affair with the popular British Novelist, Hall Caine, who wrote such novels as 'The Master of Man: The Story of a Sin'. (6) Francis is said to have met Abraham Lincoln, Charles Dickens, King William, and Louis Napoleon. The latter of which gave Francis the 'Cross of the Legion of Honour', because he supposedly cured him of an ailment he had. (7) Over the decades Tumblety was quite a jetsetter, and visited numerous parts of Europe, including Germany, France, Ireland, Scotland, and of course, England. (8) During his last couple of years on this planet, Francis moved back to his hometown of Rochester, New York, first staying with some elderly relatives, and then staying at a convent run by nuns. When he eventually died of heart disease a few years later, he was buried in a family plot in Rochester's Holy Sepulchre Cemetery. Hey! Do you know what? After all of that, I almost forgot to mention what I thought about this documentary. Well, before I bugger off to Ripper-ville, please allow me to say that it was a pretty decent program overall, with a pretty decent structure and complementary cast. Also, I have to applaud it for instilling a circular narrative within its framework, and constantly questioning itself for errors in the facts presented. Yet, whilst saying that, my one small gripe with this show, is that it was too focused as a piece, and didn't have the scope needed to pose the reverse side of this theory in a better light. Still, who care's, huh? All in all 'Jack the Ripper - Francis Tumblety' was a great documentary. It was nicely presented, and in a roundabout way kind of proved to me that maybe... just maybe... we have our Jack.